Monitoring what your child is getting into online can be scary and feel next to impossible. 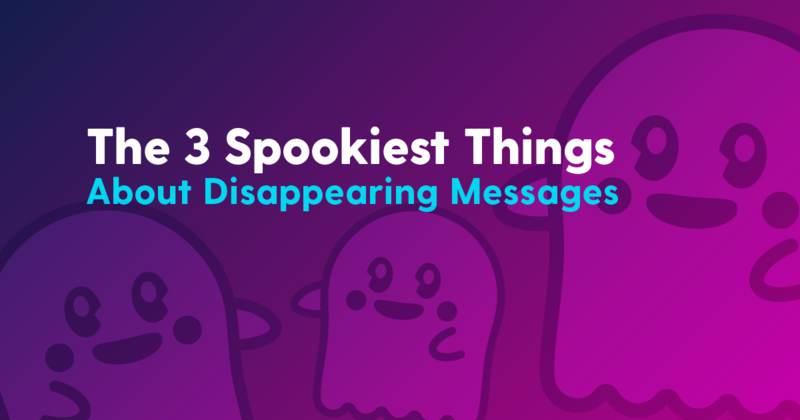 But what’s even more frightening is that one of the hottest trends in social media for the past few years has been disappearing messages — and it looks like they’re here to stay. Whether you’ve been chasing phantom messages for years or your child is just beginning to express interest, in this post you’ll learn just what’s so frightening about them. A common misconception about Snapchat and Instagram is that messages and photos disappear after a few seconds. This false belief can encourage risky behavior since kids perceive that what they send will vanish quickly – even when snapping with strangers. While it seems that things vanish shortly after viewed, there’s nothing to stop someone from taking a screenshot or a photo of the message with another phone. Screenshots and videos create a permanent digital image. Teach your child to be careful about the images and texts they send. Nothing shared is ever guaranteed to remain truly private. While Snapchat was the first app to make disappearing messages wildly popular, Instagram has since followed suit and implemented disappearing photos and videos in their direct messages and stories, as well. With 72% of teens regularly using it, Instagram has overtaken Snapchat as the most widely used social media platform, second only to YouTube. Fortunately, most parents have heard of these two pillars of youth culture. But what many parents don’t realize is that there are countless copycat apps that ape the same functionality under different names. Be sure to research new apps that your child wants to download, and require parental approval before app downloads are allowed on their device. This may sound like a no-brainer given that it’s the very reason they exist, but when you stop to truly consider the ramifications of disappearing messages, it’s alarming. We hope that your child doesn’t ever get involved with anything potentially harmful on Snapchat or Instagram, but in the event that they do, disappearing messages can erase all evidence of wrongdoing. Evidence is important in investigations, and without clear leads, family and friends can have trouble understanding what really happened. Bark can help you make sense of the complicated world of disappearing messages and keep your child safer. Cyberbullying, harassment, threats of violence, and messages from online predators can all occur in these apps. Make sure your child knows about the dangers they pose. Sign up today for your free, one-week trial and sleep a little easier knowing that Bark’s got your back.